They can be helpful management tools but are not for everyone. Some dietitians say maintaining a healthful diet to manage diabetes is easier to do with a food scale. But while food scales can certainly be handy tools, they aren’t for everyone. In fact, for some, they can make the task of managing diabetes seem even more overwhelming. The trick is to know when to recommend food scales and when to suggest other methods. A variety of food scales are available, and each one works a little differently. Some of the more elaborate ones will automatically inform the user how much carbohydrate a food has—obviously important when it comes to understanding how food can impact blood sugar control. Others will simply measure the amount of food, and the user will need to do the math to figure out certain nutrients. Of course, the more elaborate the scale, the more a patient can expect to pay for it. Dawn Sherr, RD, CDE, LDN, a diabetes educator and practice manager with the AADE, says she doesn’t like to recommend specific brands. RDs may offer some guidance in answering questions, but she believes patients need to determine what works best for them. Tami Ross, RD, LD, CDE, a personal diabetes and nutrition educator, writer, and speaker as well as vice president of the AADE, says starting with an inexpensive scale, available for purchase at most grocery stores, is wise. But she’s had a couple of patients tell her they’ve used a postal scale. If patients embrace the idea of measuring food, they can always opt to purchase a more elaborate food scale later. Some RDs say they prefer not to recommend that patients use food scales. 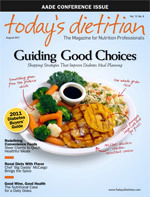 Janice H. Dada, MPH, RD, CSSD, CDE, CHES, of SoCal Nutrition & Wellness, says she believes patients don’t need them. Instead, she teaches her clients to use their hands for approximate measurements or encourages them to use measuring cups. She says it’s more practical and helps patients stick to their plan even when they’re eating out. Dada teaches clients that 1 cup is approximately the size of a woman’s fist; 1/2 cup is the palm of her hand; 3 to 4 oz of meat or fish is a deck of cards or the palm of a woman’s hand; and 1 T is the measurement of a thumb from tip to base. “I teach clients these tips and even have a visual guide to estimating portions on my website that they can download and refer to as needed,” she adds. Even those RDs who do consider food scales a useful tool recognize they aren’t for everyone. Drago says some patients believe weighing and measuring food takes away from the joy of eating since it removes spontaneity and disrupts family meals. Other patients simply dislike rules, and food scales may make managing diabetes seem even more constricting. Another factor to consider in suggesting food scales is where patients are in terms of disease management. If they were recently diagnosed, using a food scale may seem too overwhelming, says Sherr. Every patient is different and may handle the diagnosis and management differently. “Food scales might be better for someone who has been living with diabetes for a while and is looking to really fine-tune their control,” Sherr adds.